Washington, D.C., circa 1940. "No caption." I guess we'll just have to make one up! Harris & Ewing Collection glass negative. View full size. Submitted by Anonymous Tipster on Mon, 06/21/2010 - 4:35pm. "Desperate to have children, Gladys misguidedly explores the rhythm method." Submitted by MikeS29 on Mon, 06/21/2010 - 3:47pm. Submitted by OTY on Mon, 06/21/2010 - 10:50am. Commencing immediately, all celebrations in the office will cease and desist. It has been brought to the attention of management that they inevitably cause a total lack of productivity as well as a loss of inhibitions, resulting in personal remorse by employees and strained relationships among our staff, sometimes permanently. Failure to obey this policy will be grounds for termination of employment. Submitted by PJ on Mon, 06/21/2010 - 10:47am. Keeping her head down just in case, Miss Nellie Farquhar attempts to calm an office shooter with her sweetest smile and a selection from the Xavier Cugat songbook. Submitted by Anonymous Tipster on Mon, 06/21/2010 - 10:37am. When I was a kid, in the early 50s, I was brought a drum from Haiti.. It was a little smaller than the one in her lap but it did have the pegs & rope holding the hairy head in place. The family dogs were always very interested in the leather drum head. Submitted by Anonymous Tipster on Mon, 06/21/2010 - 8:57am. "I'm sitting here on a dirty floor wearing Pinocchio shoes and beating a hairy drum. Where did it all go so horribly wrong?" Submitted by Anonymous Tipster on Mon, 06/21/2010 - 8:37am. As part of FDR's Lend-Lease program, battlefield communication bongos are seen here being tested before shipment to Great Britain. Submitted by lupalz on Mon, 06/21/2010 - 5:59am. That was pretty much the look on my face the first time I *thought* I got the point of Twitter. Submitted by Dr Q on Mon, 06/21/2010 - 12:57am. The implements on the desk are hide scrapers. American Indians and other traditional cultures lashed flint (later, metal) scraper blades to convenient crooked bones or branches. Any native village had hides tied to frames. The process of converting raw skins to rawhide or buckskin started by scraping all the flesh off the inside and all the hair off the outside. The well-scraped skin could be used as-is for rawhide, or further processed by soaking in a mash of animal brains, whose enzymes dissolve the natural glue in rawhide. After thoroughly wringing out, the skin was worked and pulled continuously until dry, resulting in a soft velvety texture. After smoking to seal the fibers, the resulting "buckskin" makes comfortable and very durable clothing. I have done this myself with friends in the modern Mountain Man movement. Submitted by Jimmy Longshanks on Sun, 06/20/2010 - 10:30pm. If I nail this drum solo, then I'll be given a seat and maybe even a desk! Submitted by Anonymous Tipster on Sun, 06/20/2010 - 5:22pm. Americans need no longer fear an influx of inferior percussion instruments, government officials say. 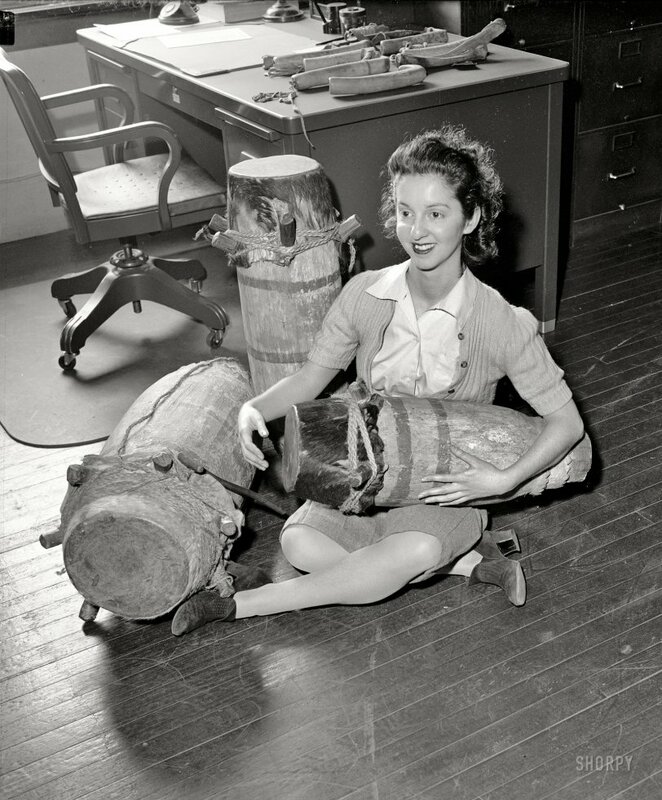 Miss Bea Carruthers, 23, seen here giving a set of drums a rigorous inspection, and her colleagues will help ensure that no substandard hand-operated Cuban drums are sold to the US public. Each wooden drum imported to the US from the Caribbean will now be individually tested by the competent staff of the OBI for solid jive, steady foo, and hep-hep on the mellow side. In the near future, Office of Bongo Inspection officials intend to increase their vigilance to assure that all cool cat instruments are reet-petite for all Americans. Submitted by Anonymous Tipster on Sun, 06/20/2010 - 4:00pm. That sure looks like a government desk and chair. Somewhere in the Smithsonian? Submitted by DoninVa on Sun, 06/20/2010 - 3:11pm. of the Ricky Ricardo Fan Club. Submitted by Anonymous Tipster on Sun, 06/20/2010 - 2:02pm. Dinosaur spare ribs in Conference Room 3. Bette Davis' kid sister demonstrates a precursor of e-mail.